Sits in between A Class and C Class. 4,270mm long x 1,777mm wide by 1,604mm high. Long wheelbase of 2,778mm gives generous rear legroom. Same sandwich floor construction as A Class. Same parabolic rear suspension as 2nd generation A Class. Same engine range as A Class with 200 Turbo from the start. 5 or 6 speed manual transmissions or Autotronic 7 ratio CVTs available with all engines. Rear seats fold flat easily without removing headrests. Plenty of room in the back. 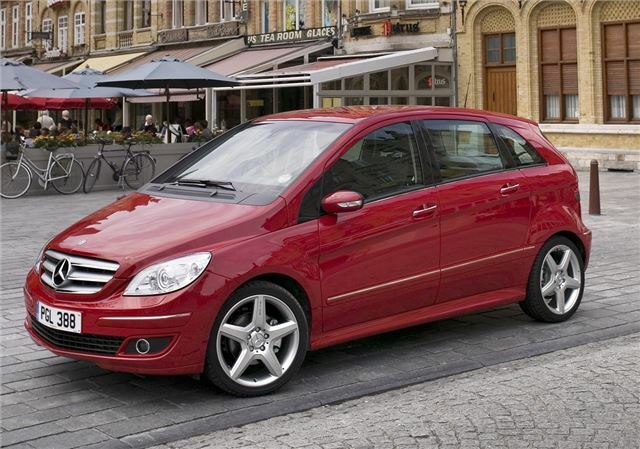 For Spring 2008 Mercedes overhauled the design and engineering of the B-Class. The facelift focused on environmental compatibility, economic efficiency and comfort. Engines now burn up to seven percent less fuel than previously with low exhaust emissions. Mercedes-Benz has developed a new ECO start/stop function for the B 150 and B 170 models. This switches off the engine when stopped at traffic lights, for example, producing a fuel saving of up to nine percent in practical use. Additional new developments include active parking assist which helps drivers to both find a suitable parking spot, and then manoeuvre into it.